Carnival Cruise Line has welcomed some colourful guests onboard its Australia-based superliner, putting the ship’s fun limits to the test. 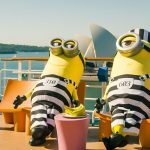 To celebrate the release of Despicable Me 3 in cinemas from June 15, the movie’s mischievous minions Kevin & Stuart took over Carnival Spirit for the day. With the cruise line and the minions both known for their high fun stakes, it turned into the ultimate meeting of cheeky minds. Check out this clip to see the minions onboard Carnival Spirit. After boarding in Sydney, Carnival Cruise Line Vice President Jennifer Vandekreeke said the minions swiftly took control of the ship and went totally bananas. “We’ve all seen the Despicable Me movies but we had no idea that these little yellow characters could get up to so much mischief on our ship,” Ms Vandekreeke said. 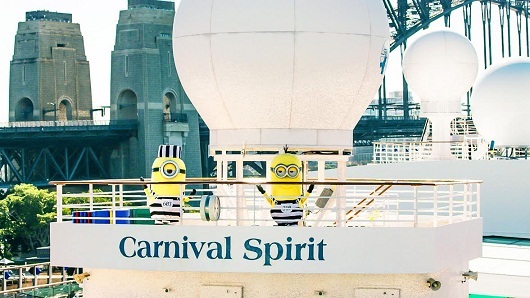 See part two of the minion Carnival Spirit takeover when the ship is docked at Circular Quay on Sunday (June 4). Stay tuned to Carnival Cruise Line’s Facebook and Instagram accounts for details on how to win one of 50 Despicable Me 3 packs, which include a family pass to see the film.